Roasted turkey breast is a great alternative to roasting a whole turkey. A four- to five-pound turkey breast will feed six to eight people, it's a cinch to carve, and it's perfect for making sandwiches the next day. You can roast a turkey breast in about an hour, as compared with up to five hours for a whole turkey. 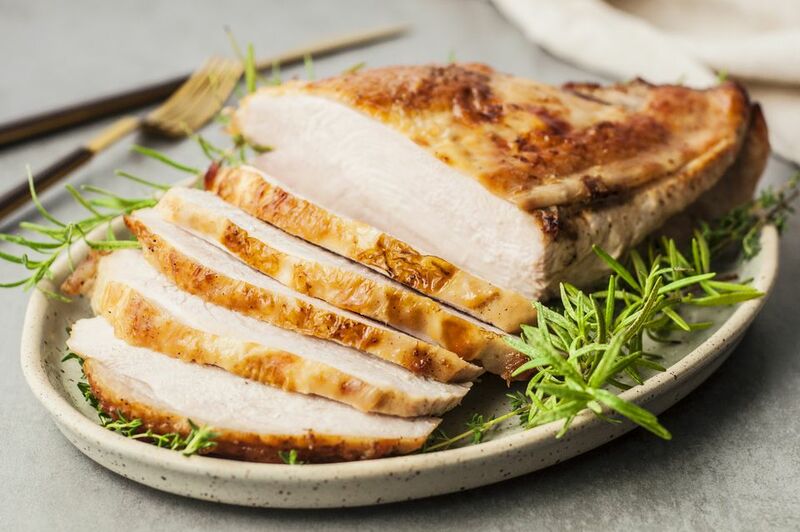 Another bonus: With no dark meat to worry about, you can roast a turkey breast at a higher temperature than you would a whole turkey, so the skin gets nice and crispy while the meat remains moist and juicy. For this reason, be sure to get a skin-on breast rather than a skinless one. If you want to cook a bone-in turkey breast, that would be a half-breast, i.e., a single breast. For boneless, you could do a half or a full (double) breast. Either way, just ask your butcher to roll and tie the boneless breast so that it cooks evenly. Finally, a whole turkey breast is a wonderful candidate for brining. Feel free to baste the breast as well. The pan drippings and stock from basting will help with making turkey gravy. Place the turkey breast on a rack in a roasting pan. Brush turkey with the melted butter, then season generously with Kosher salt and black pepper. When thermometer reads 155 F, remove the turkey from the oven. Cover loosely with foil and let it rest for about 20 minutes (or when the thermometer reads 120 F) before carving and serving. The target temperature for white meat turkey is 160 F, but we recommend taking out the turkey at 155 F. It'll hit 160 F as it rests. For best results, use a meat thermometer like this one, which has a probe that you insert into the meat before roasting, and leave it there. Set it for 155 F and it will beep when it's time to take it out. And don't remove the thermometer probe, but rather, leave it in while the breast rests. When the temperature reads 160 F (which will be somewhere in the neighborhood of 20 to 25 minutes), it's ready to slice.